I don’t often catch myself in a looking-glass but last night I was smoothing back my greying pelt before going out for mince pies, and for a moment glimpsed myself. My paws were clasped behind my neck and the negative space between shoulder and paws had created a cherubic pair of wings. It made me ponder about perceptions, positive and negative, and Christmases past and present. I had thought that the murmuring mole might stay silent on Christmas Day, but I remember Christmases past when all external structures and daily contacts have slipped away; times when alone-ness, absence or loss have made themselves most acutely felt. Often. at times like this I have met with acts of extraordinary kindness, been taken in and nurtured. 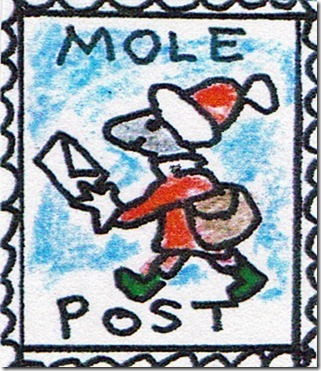 I wish those of you who are celebrating with families or friends a great Christmas, but I especially want to send my molehugs to those of you for whom this is a difficult time. I hope you can find soothing music, a good book or a jigsaw puzzle. Or perhaps a stroll is more up your street, or a crossword, or writing a letter. I am about to put my kettle on. You might like to join me By putting on yours so that we can toast ourselves with a good cup of tea. When I go for my early morning walk I sometimes don’t see a soul, or maybe just a figure in the distance. From time to time I might meet a someone coming the other way. We will greet each other, perhaps even have a brief chat. But this morning I was walking up the hill and where my path merged with another I found myself suddenly side by side with a fellow creature. We strolled quite happily together, talked about Hamlet, and then our paths diverged again. The merging paths stirred a distant memory. I was on the back seat of a stuffy little Morris 8 somewhere in France. We had been somewhere in France for many, many hours and been lost several times. It was very hot and I would have liked to have stuck my snout out of the window, but it was only allowed to be a little bit open, just enough to get rid of the petrol fumes, but not so much that it made a draught. I couldn’t inch it down further because it squeaked and gave the game away. A chap at the office had lent Papa the car. Mama was navigating. Still, all the discomfort in the world couldn’t undermine the treat I had on my lap: the Green Book of Puzzles, given to me by Great Uncle Mole, and now I had hours and hours to immerse myself in it with no-one asking any more of me than that I should keep quiet. I was trying to nut out a particularly challenging pictogram when I heard Mama saying that we should be coming to a fork in the road. Perhaps it was the pictograms and their incongruity that gave me a sudden image of a giant silver fork stabbed down in the middle of Route N74 as if it were mere mashed potato. ‘Is that “une fourchette dans la rue”‘, I asked with all the puffed up pride of an eight year-old mole who has just done a term of French. Mama said she had no idea. She was turning the map upside down. Forks were now the least of her worries. She had to work out how to circumnavigate Chalon. We seemed to be heading for Lyon instead of Geneva. ‘Nearly’, said Papa, who was rather more interested in linguistics than driving. “Fourche de routes”. A fourchette is a derivative of fourche from the Latin furca.’ I had no idea what he was talking about. And I was still none the wiser as to what a fork in the road might mean. ‘It’s a bifurcation. Or perhaps…’. He paused. ‘Perhaps it could be any number of divarications’. I could see his face in the rear-view mirror. His eyes had taken on that dreamy look he had when his mind was elevating itself above the dreary business of everyday living. Mama suggested he should concentrate on where we were going. A fork in the road, whether literal or figurative, should be an exciting thing – an unexpected manifestation of options, but for me they more frequently present unresolvable dilemmas. I come to a standstill and go no further lest I take the wrong route. This afternoon I spent a little time with my snout in Great Uncle Mole’s O.E.D., trying to convince myself that if only I understood forks a little better, I would be able to resolve my fear of them. Fork is a very old word, but then I suppose pitch-forks are very old tools. And strangely, it is the older figurative uses of the word, the ones that are obsolete, that most accord with the sense of unease I have about forks; the way they pull the rug of certainty from under your paws. In 14th century courts, witnesses whose testimony was contradictory were said to be forking. In the 17th century a forked fee was a bribe extorted from both sides; a forked argument was one that was deliberately ambiguous, or one that contained a dilemma. If you stumbled over a word, or used the wrong one, you might say your tongue was forking. In other words a fork is a deceptive trap. But when I resurfaced from the O.E.D. and allowed myself to ponder again about my morning stroll, I realised that there was indeed a different way of looking at a fork. The path I had taken was not the handle but a prong and what I came to was a confluence not, as Papa would have put it, a divarication. Is there some way I can turn my fork phobia on its head? Can I trust, somehow, that my fellow prongs will do what needs to be done without my meddling, and that we shall come together in the palm of the fork with complete synchronisity? We have been visited by deliciously unseasonal weather. Today there is snow on the mountain and a pelt-tingling antarctic breeze outside my burrow. Perhaps it will make the anticipation of Christmas more real. One of my dear molekin sent me an advent calendar this year, too. It transported me back Christmases past. Every year we celebrated the tea-chest ritual at the parental burrow. With a lot of huffing and puffing it was hauled up from our notorious cellar and was plonked ceremoniously in the middle of the parlour. The lid was eased off with the claws of a hammer and then, with as much restraint as possible we dug out baubles and paper-chains, tinsel and lights, flinging the wood-shavings onto the carpet. And our mama would retrieve the advent calendars She could never bear to throw anything away, and so they accumulated, year by year. They were displayed, precariously, on the curtain pelmet, obliterating the photographs of her children. The more I ponder about advent calendars the more I appreciate what wonderful inventions they are. They draw out the pleasure of anticipating a major event ahead, and they also encourage us to savour each day as a separate entity. They are a rather splendid model for planning. Had we mole-scamps given a second thought to the old advent calendars, we could have opened a window for every day of the year, several years even – reflected, too, on years past. It was this remembering the past through the provenance of each calendar that made me delve back into old murmurs. This, it seems, is the 50th murmurs of mole, and I thought I might turn it into a sort of – well not exactly an advent calendar. Over the last year you have accompanied through highs and lows, seasons and idle thoughts and writing hiccups. And you have been introduced to several members of my extended and scattered family. It seems only right that they should be gathered together as the year draws to an end. Imagine, if you can, that each of the twenty links of what I shall call my reflective calendar is a window back into their lives. Unlike an advent calendar the sequence is unimportant, allow your curiosity to take you anywhere you might like to revisit. It all began a year ago with a snout and a little exploration. -1- I took you to St David’s Cathedral to ring the new year in. -2- And I first introduced you to Great Uncle Mole and Uncle Ratty as they changed their calendars. -3- These two were such steadfast influences on my early life, and remain be a great source of inspiration and succour. We explored encyclopaedias with them -4- , and played with maps with Uncle Ratty,-5- if not being taken on his wild adventures of the mind, -6-. We met Mathilde, Tante Mole’s terrifying companion from Mulhouse-7-, learnt of her courage -8-, and how she returned from the grave -9-. Even more alarming was the neighbour Trelawny, -10- whose field held a tale that haunted poor Great Uncle Mole into his old age -11-. Uncle Ratty’s tempestuous sister made a brief appearance -12- , as did the not so subtle Mr X and his narcissistic brother, the amateur psychologist Cousin Ezekial. -13- We have not seen the last of them. We dug even further back into the life of Molex whose life was transformed by a lantern slide show -14- , And came closer to the present with Grandpa Mole -15-And Grandma Mole who adored colour -16-. I introduced you to my familiar Monsieur Boo -17- , contemplated his life under the oak tree -18-and bade farewell to two friends,-19- and -20- in winters that make today feel like a heatwave. It has been quite a year – but would have been nought if you, dear readers had not been anticipated, and might have faltered without your support and encouragement. Although my paws have been on the ground my snout has been in the clouds. The chimp arrives to pick up the post in ten minutes – but, alas, murmurs is not yet ready to go. I was moseying about at the market the other day when I overheard a comment about how in the zen of archery a mole is to aim beyond the target. It stuck in my mind because I find targets and goals and endpoints rather forbidding. They become bigger the closer you get to them, so big that the concept of beyond becomes entirely obscured; so big that it is much more comfortable to stay where you are than get any closer. But if you were to focus on the space beyond the target, well then it would shrink back down to a gentler scale and, who knows, it might that you pass it without even noticing. Had I been a less inquisitive mole, I might have wandered up to the nearest hill, taken up a lotus position and pondered this thought for a while, allowing it to seep into my being. Over the next week or so I might have brought the thought to life and put it into practice. I might have seen whether diminished targets lost their ferocity, whether I felt more courageous about approaching them, whether the far blue yonder (now visible) drew me on. But I never can leave well alone. I decided to do a little digging, and soon began to think I had rather got the wrong end of the stick. For practitioners of Kyūdō, or the Way of the Bow, the target is seen not as a destination at all but as a mirror of one’s intentions. The archer is not shooting to hit the target. Hitting the target is a result of one’s right intentions. More than that, it is the result of a selfless alignment between heart, arrow, movement and the natural world. And each time the arrow is raised, drawn, and shot, it is done with such singleness of purpose, with such preparation, that it might be crowning point of one’s life. This required even more pondering. I thought about it when I lay under my doona last night, when I moseyed about on Knocklofty this morning, and over my banana and walnuts at breakfast. And it filled my mind when I was practicing Qi Gong in my weedy garden, especially in the second movement in the eight brocades when a mole takes an archer’s stance and is asked to draw the string of the bow back past its ear. The intention has to begin long before the raising of the bow. You have to discern the target, distinguish the false from the true. As Zen master Torei says, ‘If the target isn’t right, it’s not even right if you hit it’. I still want to ponder my first impression, to think about seeing the world beyond the work I am trying to complete, to see an afterwards and a broadening out. I want to breathe deeply, not freeze in fright as ends draw near. But I also want to go deeper into right intentions, smooth alignment and giving the moment its own life.